In a tight field, this bank’s independence, allied to its commitment to genuine intermediation,wins it the prize.MDM is a money-gusher, too, achieving a return-on-investment for the first three quarters of 2003 of 46.6%. 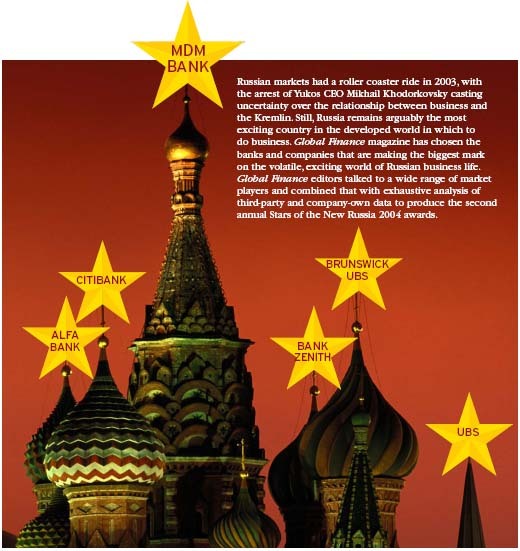 Investment banking strengths would have made it UBS Brunswick (and Citi’s bond team have had a quietish time in the absence of major hydrocarbon activity), but the world’s premier global financial brand is digging ever deeper into the fabric of Russian life. It is the lead loan arranger in the country and is perhaps the strongest over- seas contender in the booming consumer finance market. MDM Bank has grown its Russian corporate book fast, without the benefit of links to allied industrial groups.That combines with a strong position in trade finance and allied skills to provide a robust offering to Russia’s companies. The Sibneft-Yukos merger may have evaporated (leaving just a tiresome league table spat in its wake), but no Russian house managed to combine advisory, research and primary markets ability into as strong an investment bank offering as this robust hybrid. Moscow International Bank puts up a strong showing in foreign exchange,but Alfa Bank,with its large domestic network and subsidiaries in Ukraine, Kazakhstan,London,Amsterdam and New York, is the dominant force. It is part of an industrial conglomerate, the Alfa Group, which has interests in oil and gas, commodities trading and telecommunications, but the bank has recently shifted its strategic priorities toward commercial banking and away from inhouse banking. Alfa Bank is one of the few Russian banks with accreditation to insure medium-term credits with the participation of the US Export-Import Bank, as well as with the export credit agencies of Russia’s trade partners. 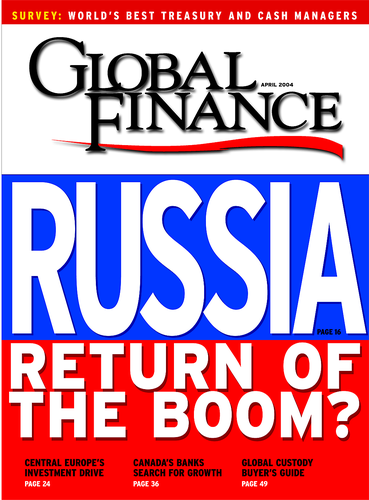 The global financial powerhouse dominates the syndicated loan markets for Russian borrowers, helping to bring a roster of corporate heavyweights to market.The Yukos affair provided a parenthesis in a year previously marked by plunging yields, lengthening tenors and the emergence of unsecured borrowings. Most players expect a likely sovereign upgrade to provide a benign background for this year’s loan market. Runner up to Citibank in the loan league tables, SG combines advanced structuring know-how and sector expertise to hold onto this slot. This is territory still best navigated with the help of official export credit, trade or multilateral agencies. In fact, true project financings were thin on the ground. Raiffeisen teamed up with the IFC to provide project financing for a project to expand a wood panel factory near Moscow for Swiss-based Kronostar. Still, that’s small beer compared with deals bubbling under to finance looming projects such as the $10 billion Sakhalin LNG project. This bank has targeted Russia’s domestic bond market and tops the underwriter league tables. Like its rivals, it will need to revitalize its recipe to kick-start a market that stalled badly after a mid-2003 correction in yields. Primary market strength translates into secondary presence at this market specialist.The second-half 2003 correction wiped out some primary market excesses, but secondary market players have yet to undergo a real testing in this market cycle. Russian corporate bond players regularly cite the quality of the debt market research of this tightly focused house. Zenit goes as far as issuing its own ratings in conjunction with a Russian magazine. In a remarkable year for bonds from central and Eastern Europe, Russia has accounted for the lion’s share of the action.A revitalized emerging markets debt team and UBS Brunswick’s top-drawer address book has put UBS at the top of the bookrunner pile. In a competitive market where three houses regularly vie for top slot, UBS Brunswick edges the award.Top-rated analysts Paul Collison and Peter Boone are the stars in a team with depth and staying power. Despite the paucity of primary flows in 2003,Aton Capital has continued to capture a leading share of the booming trade in Russia’s leading stocks. Alfa Bank did more deals last year,but UFG’s trophy role in advising UK oil company BP on its $6.3 billion stake in Tyumen Oil makes it the winner. The on-off Yukos-Sibneft merger (on which UBS Brunswick advised) hogged the headlines,but observers say M&A; attention is shifting from hydrocarbons to the precious metals sector. UFG’s recent link-up with Deutsche Bank should help further. Advising on the June 2003 $8 billion joint venture between BP and Alfa Group/Access-Renova helped propel Alfa Bank to the top of the advisory tables, but the bank also advised on deals involving ICN Pharmaceuticals, Eniseytelecom and BaykalWestCom. With pension reform opening up Russian workers’payrolls to private-sector fund managers, there’s a Klondike air about this sector. Overseas players are moving in, smart home-towners like Alfa Capital are hiring,but UFG’s mix of local and international savvy gives it a distinct edge. Baltika is Russia’s biggest beer brand, but sales have gone flat in the past year. Instead, it is SUN Interbrew that has charged back in a market that still has great growth potential. A two-year on-off negotiation process with International Food Group ended in November 2003.That the company’s owners were prepared to pull the deal if the price wasn’t right reflected the confidence at this brand king, owner of many of Russia’s best-known household names. A late-2003-announced merger with Siloviye Mashiny propelled UHM to the top of Russia’s engineering pile and created a company better able to compete with international houses. A 2003 listing on London will help the company access the capital it needs to restructure and grow. Founded in 1992 by now-CEO Anatoliy Karachinskiy, IBS is Russia’s leading tech-consulting firm. Its client list is a Who’s Who of overseas blue chips setting up shop in Russia, as well as home-town ministries and corporate giants. Chinese demand is helping drive world nickel prices through the roof in anticipation of looming shortages.No one is better placed to benefit from that than Norilsk, the globe’s largest nickel producer. The Yukos affair has buffeted almost all Russian oil and gas companies, but Lukoil has gained more than it has lost. Holding the second-largest private oil reserves in the world, Lukoil has a strong hand in negotiations with would-be foreign partners. Moscow Telesystems is the market leader in Russia’s high-margin cell phone market.That gap may widen if a legal dispute over nearest rival Vimpelcom’s Moscow area license distracts the company’s management. Stakes are always high in the poker game that is the restructuring of this country’s electricity monopoly. But despite the well-trumpeted antagonism between the Kremlin and UES head,Anatoly Chubais, overseas power groups are beginning to follow where portfolio investors led, by bidding to run UES plants.